Did you plant chrysanthemums last fall? Autumn is the most popular time of year of the four seasons to plant them but not necessarily the best time for the plants. Chrysanthemums are one of the most hardy cut flowers. It's why most florists use them to fill up flower arrangements and bouquets. They do need a little special care and are well worth it. To help your mums pull through winter, make sure the plants are kept moist. Water the plants 1-2 times a month by pouring a good gallon of water around roots. Keep mum roots mulched to minimize changes in temperature causing the roots to literally heave out of the ground. Here are a couple of mums I bought for 25-cents last fall that are making it so far through our Missouri winter by getting water and being mulched. From the top it looks like the plant is dead. Plant starts, however, are peeking out from the sides. 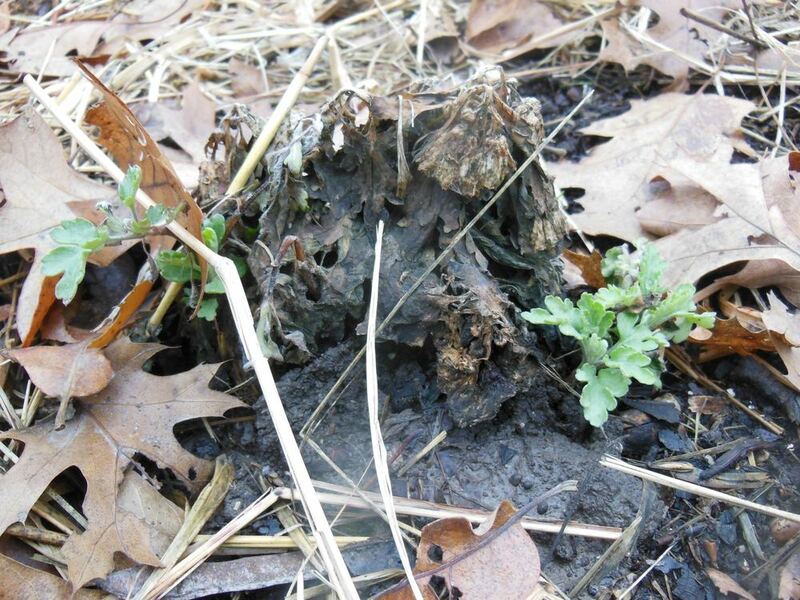 By keeping roots moist, plants will be ready to grow as soon as temperatures warm up. The full season of growth will make them stronger for fall blooms and you should now have repeating blooming chrysanthemums.